Today you will learn, How to Install macOS 10.14 Mojave on VirtualBox on Windows? But before getting started let’s know about macOS 10.14 Mojave. macOS 10.14 Mojave is the new operating system for Mac computers which is named from desert instate of the mountain this time. During the Worldwide Developers Conference (WWDC) 2018, Apple revealed they are working even more on their services. Which covers macOS, TVOS, watchOS, iOS and Finally macOS. After macOS 10.13 High Sierra, Apple brought many effective and required features inside the macOS 10.14 Mojave. Some of the major updates are Dark Mode, a dynamic background which changes according to the hour of the day, Voice memos, Group FaceTime, New App Store, News, Stocks and more. The good news is that John, the founder, and admin of techsviewer.com, created the macOS 10.14 Mojave Virtual Image for Windows Users. Infect anyone who has the mac, can create Virtual Image of Mac OS for Windows Users. 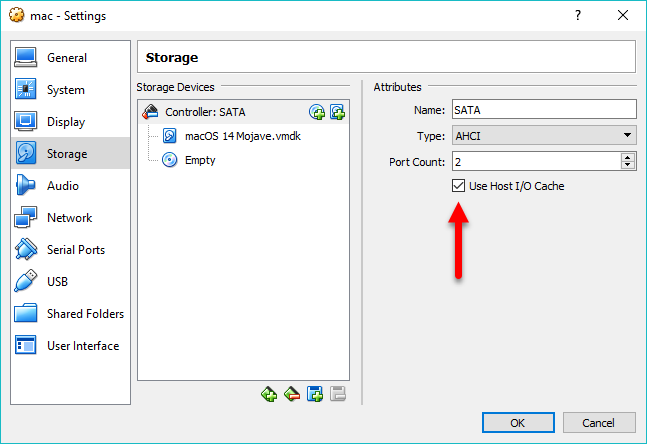 if you want to know how to Read the How to Install macOS High Sierra in VirtualBox on Windows 10 by Justin Pot on Howtogeek.com. 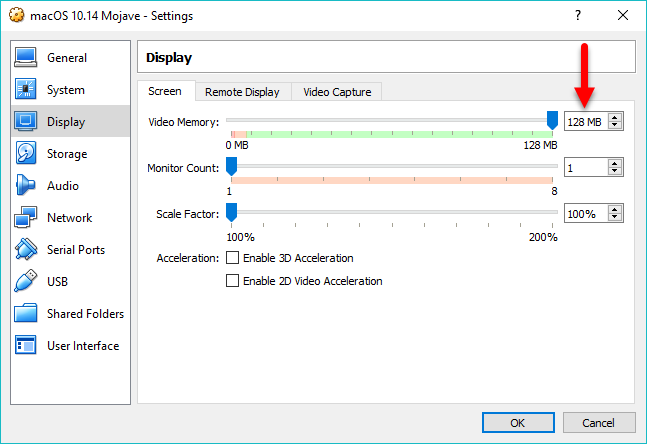 So, Windows users, if your PC has at least 6GB RAM, 64-Bit Running Windows, then you are welcome to use the macOS 10.14 Mojave. According to John, your PC must have an SSD too, but I am testing mac operating systems on HDD. The Reason Why I am recommending an SSD is, Further your HDD will face too many much problems just like mines did. VirtualBox is an open source virtualization software for mac, windows, Linux, and Solaris. If you are about to install and test macOS 10.12 Mojave on Virtual on Windows, you need to download & Install the latest version of VirtualBox. However, if you are using Virtualbox 4.x and older version again it can work, but it may cause you some problem. macOS 10.14 Mojave is compressed and zipped for storing less storage and security. While creating macOS 10.12 Virtual Image we, usually compress them because of its size. The actual size of macOS 10.14 Mojave is 10 GB & when we compressed it, it becomes 6.x GB. In order to unzip the macOS 10.14 Mojave, you can use 7Zip or WinRAR. 7Zip is an open source application but WinRAR gives you 30 days to purchase. Once you installed VirtualBox on your system, launch the program, and click on “New” at the top window. This will open the Virtual Machine Wizard. First, type a name for the Virtual Machine. After typing the name for Virtual Machine, copy it. For Memory size, increase its memory up to 4096 MB which will be 4 GB RAM. Note: While typing a name for the virtual machine in VirtualBox, it will detect the version and architecture. But If you type unfair name like test 1, it won’t detect the version and architecture, that select them manually. 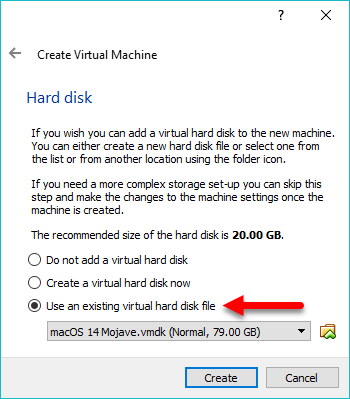 First, Select Use an existing Virtual Hard Disk File. Then, click on the yellow folder and locate the macOS 10.14 Mojave. Once you did that click create. To edit them, select the created Virtual machine and select settings. First, open system panel and uncheck floppy from boot order. 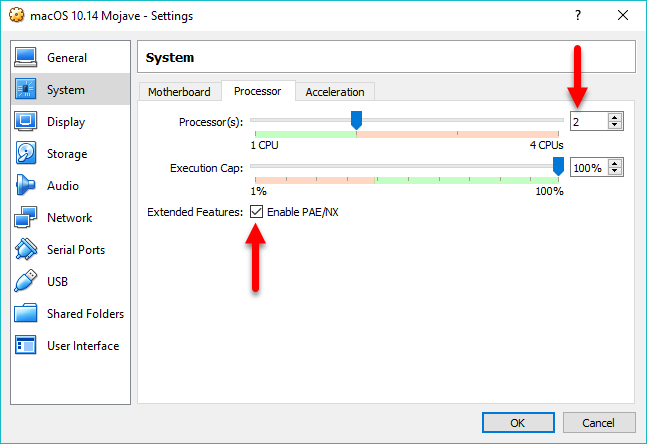 Now, move to the Process tab, increase the amount of processor from 1 to 2 processor and also enable the Enable PAE/NX feature. Move to the Display Panel and increase the video memory from 1 to 128 MB, if you desire you can also enable the 3D accelerations. The last one but not least is enabling the caching feature. To do that, visit the storage tab, on the attributes panel enable Use Host I/O cache. By default, VirtualBox has the ability to support the Apple operating system. But when you are testing Mac OS, it fails to start the process of installing and using Mac Operating Systems. That’s the reason for using the codes. VBoxManage setextradata "Virtual Machine Name" "VBoxInternal/Devices/efi/0/Config/DmiSystemProduct" "MacBookPro11,3"
If you Remembered, while creating Virtual Machine, I told you to copy the Virtual Machine Name that you are typing. 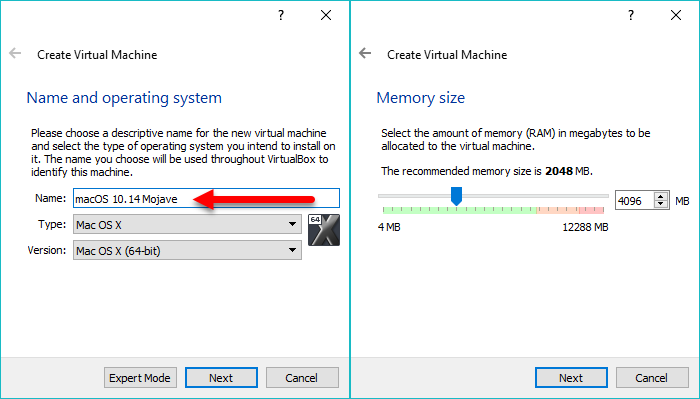 Now you need to Replace that name with "Virtual Machine Name"
Once you replaced the name with Virtual Machine, follow the below procedures. First, Run Command Prompt as Administrator. Copy each line of code one by one and paste that on Command Prompt. When you did press enter. Open VirtualBox and start the created Virtual Machine. Wait for some seconds until the codes panel and apple logo go away. well, It was all about How to Install macOS 10.14 Mojave on VirtualBox on Windows. I hope it was helpful for you for testing the new macOS 10.14 Mojave on Windows. If you really liked the post please comment on the post, so we feel better. And by the Once read the what’s your idea for this Post and give us 5 stars. How to create a Bootable macOS Mojave USB Installer drive on Windows? 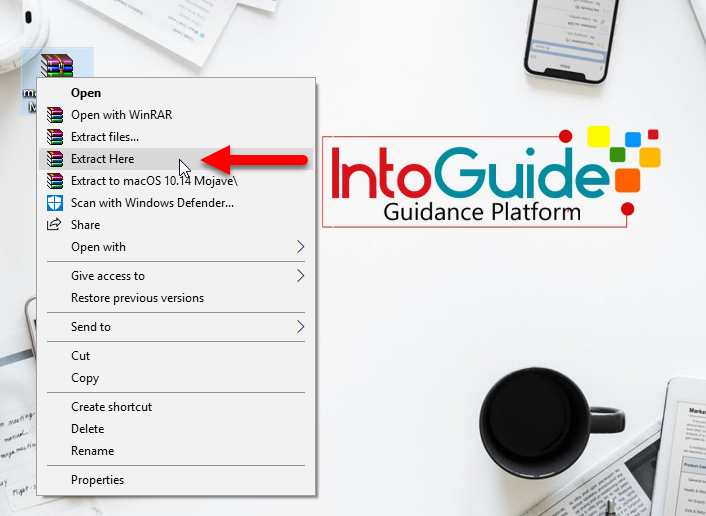 Pingback: How to Install macOS Mojave 10.14 on VMware on Windows 10? Thank you very much for this article, it helped me a lot and will help people in the future. You are clear and explain by the simplest way how to do things where others will complicated things. I appreciate the work you did for us and want to thank you again for having done that work for us. I’m Gald that it helped you. i don’t really know why your page and your youtube channel not yet been discovered by many peoples, because, everything looks professional and done very well. you know this talent of yours is so amazing you should study become a teacher and for sure you’ll help a lot of student. Our site is newly launched and Google and other search engines have not indexed our site completely. Well, Thank you for telling us about being professional, I am looking forward to be a teacher soon in Udemy. Yes, we are a team. Thank you so much for commenting and letting us know your opinion about our posts and wishes for our site. After I run cmd and insert all the codes by one just like you did, whenever I boot the Virtual Machine it fails and shows my pc name. This means that it detects my pc info instead of the ones I just put. I will try a different version than VirtualBox 5 to see if that works. Any help would be nice. Let me Explain in detail to you . VirtualBox cannot be closed when you are hitting the X, Instead, it is the running in the background and when you are applying the codes, VirtualBox is running, so it won’t accept the configuration. To fix the error which you are facing, navigate to file menu> exit, then apply the codes one by one, I am sure it will answer. Thank you so much for this. It’s well explained and simple to follow. I was able to follow exactly. However, I got stuck on step 7, where I had to install the macOS. On the welcome screen, my cursor is stuck in once place on the screen; non of my peripherals, like the keyboard, touchpad and mouse responds when I start it up. So I cannot proceed when it asks me to select the language. Please, do you know what the problem could be? I tried going through the whole process twice again, but the same problem. I would appreciate any ideas that could help resolve this. Thank you. To fix this error, Install “Oracle VM VirtualBox Extension Pack” after installation Open macOS Virtual machine settings, select tab “USB”, then enable USB 3.0. This Will fix the error. Hi, i’ve done everything like you said, but everytime i start the machine, after all lines with text, instead of apple logo the machine restarts itself all over again? Can you please tell me a fix? Hi, That is also an error of codes. If you do not exit VirtualBox Properly, it won’t go forward. So, Exit virtualBox and Apply the codes one by one on cmd. If it didn’t work please let me know, so I have to do some tests. I restarted my pc and add the codes again. It worked, but it’s laggy and buggy. Maybe it’s my sistem to low on power… Thank you again for help and for the tutorial. If you would have read the post, you would know what are the system requirements. Thank to you for this guide, this is good tutorial, but I found some problem in this version the Finder is not work probably. 1- Make new folder in desktop, and try to open it. You will see the finder is make relaunch again but not open folder. 2- In Finder menu bar select GO and choise any folder like Recent, Desktop, Applications or another folder you will see Finder make same problem. 3- Select Apple icons from menu > about this mac > storge , you will see the window is crash . 4- File Cash after install this guide is take from memory about 1.5G, install memory cleaner application from apple store you will show this problem. I searched about how to reinstall Finder pakage or fix it , I found some tutorial but not solution it. I will check it. Till that time download, this macOS Mojave and try. Hey, I found How to fix this problem. Change your Guest Version to Other 64bit, select tab Storage and enable “Use Host I/O Cache”. Thank you so much for the help. I’m a two days searching a lot about how to fix this problem. You saved my life! Hola…. Soy de Perú, tu artículo es bien claro, lo digo yo que nunca había hecho algo similar,muy recomendable. I’m still ending up with “End RandomSeed” even though I’m using the latest vmdk. My CPU is AMD Athlon X4 860k, and my VBOX is 5.2.16. Any idea on whats going on, and how to fix it? Hi, Do you know the reason why the “End RandomSeed” occours? well, this error occurs because virtualbox is not quiting from background process, and when you are applying the codes in CMD, it won’t effect and the randomseed error occurs. 1. when you are done with step 5, go to file, and select quit. don’t click on the x button to close the virtualbox instead go to file and select quit. 2. once virtualbox is closed for good, apply the codes and follow the other steps. I made sure to exit VirtualBox completely, but the problem persists… Any advise? What about the code, did you paste the name of the virtual machine in it or no? VM VirtualBox Extension Pack, after installation Open macOS Virtual machine settings, select tab “USB”, then enable USB 3.0. I just want to make an app in xcode and try the app on my iphone. but my xcode seem cannot recognize my iphone all I can do is sent my app to simulators…..
Is there any thing I can do to adjust it…. ps: my mojave can both recognize iphone and USB drives, but only xcode not. thanks. I’m so sorry but I have no idea about code. The same error occurs as bosko when i start the vm RANDOM seed screen appears, THANKS! The only reason which I know about Random seed error, is codes. if the virtual machine is not closed from background process or if the codes are not having the name of the VM random seed error occurs. All I can tell you quit the VM properly and start once again and the error will sort out. I am sorry their is not any way but updating of your system, or reinstalling of the OS from scratch. I wish to clarify that, in my case, I made completely sure that VirtualBox was completely shut down before executing the commands in CMD and that CMD was running as administrator. I created the machine from scratch, following each and every step in the guide, before I entered the codes, I restart my host machine. Then, after restarting, I made sure no VirtualBox processes were running. I then executed each and every command LINE by LINE. Finally, I started the machine, and the result you can see in the screen capture. I’m beginning to think that this problem is either caused because the image DOES NOT support AMD processors (in the host machine) or the first command line, which sets the cpuid, is not compatible with AMD processors. Do you have any other ideas on how to fix this problem? Hi. This is a problem with AMD processor, I’ll make a tutorial help you fix this problem as soon as I Get the Latest version of macOS Mojave. The final version is out. Where is the amd tutorial? I know the macOS Mojave latest version has released but creating a different VMDK For AMD Processors takes time. AMD Processor has a kernel Problem from Hardware where Intel Processors have a built-in technology of macOS Mojave. Again if you need it too soon, there is a way where you can Install macOS Mojave on AMD Computers especially on VirtualBox and VMware, but this method is too much longer then others. If you want to know please let me know. I’m not Brandon; but I’m definitely interested in a tutorial for MacOS Mojave on VirtualBbox OR VMware for AMD Ryzen. If you could help us, that would be awesome! Well, you have to install macOS High Sierra or the earlier versions of mac, once that is installed, then download the macOS Mojave dmg file and upgrade from older version of mac to the newest version. Unfortunately, right this is the only method unless you have to wait for macOS Mojave VMDK For AMD Processors. This is what I get when I paste the first line. Hey, this is an error of location. For now, I can only tell you one thing to fix this error. 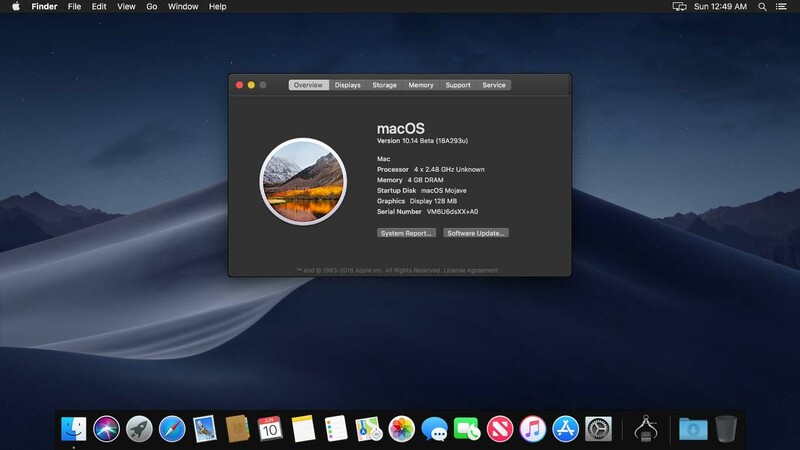 Extract macOS Mojave on You Desktop and again follow all the steps of the article, it will be fine this time. 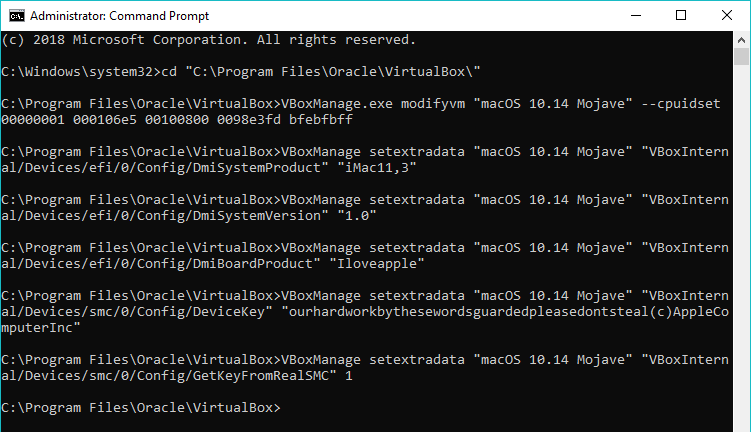 Since the location of the configured files of macOS Mojave is not found on the “C:\Program Files\Oracle\VirtualBox\” location, that’s why this happens. Hi, I’m having a little trouble here. Seems something went wrong after continuing system boot. Do you have any idea how to fix this? This occurs because you have not applied the codes. Once you created the macOS Mojave Virtual Machine, go to file and select exit. Then open CMD as Administrator and Apply the codes one by one. And remember to put instead of Virtual Machine Name, your Virtual Machine Name. Hey, the VMDK file is created only for Drive C, You can put the VMDK File in any drive which you want but you can’t save it on any other location. If you do, then it won’t work. Extract the macOS Mojave on the Desktop then Create a new Virtual Machine. Don’t save it on any other location except for “C:\Program Files\Oracle\VirtualBox\”. This is the path where the macOS 10.14 will be registered. If you didn’t get, follow the video inside the article. hey, how to resize the virtual machine? right now it’s on 1024*760 resolution and when i go on resizing it grey out all the other options. Thank You for your help! Sorry, it took some time to create the article and the video. Excellent tutorial, but i would like to add something of benefit to others.. I hope this will help those doods with resolution issues. Yes, I know VirtualBox can’t support the 1366 x 720, that’s why today I published an article with Video to fix the Screen resolution on VirtualBox. I will add your code that article. Once again hope this helps. Possibly along with your Mojave tutorial you may want to include this..
this can be acheived without scaling (which by the way looks terrible). select “Veiw” from the vbox menu then select “Full Screen”. This can also be acheived by pressing “Ctrl + F” on the keyboard. You may have done something wrong, please explain more clearly. What’s the problem you get with using an HDD? It harms the HDD? Hi, Yes it can harm the HDD. I installed MacOs Mojave on VirtualBox and when I launched the machine for the first time, I arrive at the configuration menu and I can not use neither my mouse nor my keyboard! I can not do anything. To fix this problem Install the Oracle_VM_VirtualBox_Extension_Pack. The download link may be in the comments, find there. I didn’t get you, can you explain more clearly. Please have patience, it is coming soon. Have you confirmed virtualization is enabled within BIOS? At step 7 my installation did NOT reboot, it went to UEFI Shell> prompt and just sits there every time. Hi, send your system details. I don’t think that PowerShell or CMD would effect, but again you have to try the CMD once too. send me your system details. I do not mean by windows, I mean by processor and ram and generation. great tutorial one problem no mouse or keyboard. i get a message about capture and host key, i cannot get past the pick a country screen. Any guidance would be greatly appreciated. I’m using a HP ProBook 4530s. Any tips on getting the WiFi card connected through on / after the Mojave install please? It is a Qualcomm Atheros 802.11b/g/n WiFi adapter. Yes, You can buy a Wireless Adapter. I’m using it for my server and certainly you can use it for macOS Mojave. Why should I need to buy another wireless adapter please? Is there no way of getting the built in Wifi adapter to work with Mojave please? Hey, If you have installed macOS Mojave on PC then certainly you need to use a wireless adapter but if you are talking about the VirtualBox then it is working perfectly. 1) OSX keeps on restarting and not getting to the LOGIN screen so I am thinking of uninstalling everything, including VirtualBox and starting again or using a different machine name to reinstall Mojave. So it wasn’t working perfectly. Never mind, I unsinstalled VirtualBox and started again. Everything is okay now. I am stuck at the Welcome Screen. Mouse not moving. Whats the take here please ? Hi, I have an issue which somebody else has also discussed. When I boot MacOS, everything stops at End RandomSeed. I have followed all Steps, quit VirtualBox by File > Exit, applied all the codes in CMD, and tried to boot numerous times, but to no avail. Could you please assist? \macOS 10.14 Mojave\Logs, asi como una descripción de lo que estaba haciendo cuando ocurrió el error. Note que puede acceder también a los archivos de arriba seleccionado Mostrar historial de eventos del menú Máquina de la ventana principal de VirtualBox. I’m so sorry, I didn’t get you. can Please type in English? The codes are not applied correctly, apply them correctly and it will solve. I get to Waiting for DMOS…. It get stuck here. I followed all the directions and did the code after closing Virtual box by doing file -> exit. Any recommendations? I’m using intel i5 and gtx 1050 ti. I have no idea about this error but I would recommend you to Install macOS 10.14 Mojave on VMware Workstation Pro Because VMware is more professional then VirtualBox. My windows key doesn’t have any effect on the mac os menus, is this normal? I didn’t get you quite well, if you mean mean keyboard is not working, install virtualbox extension pack. I get the RandomSeed problem as well, but as far as I can tell did nothing “wrong”. Code is applied correctly after quitting VirtualBox and then pasting in CMD, as mentioned above. Thank you, But I didn’t get you. As part of the main instructions, maybe mention to ensure that the extensions are installed and enabled USB 3.0 on the USB tab. I wonder why the author ignores the messages about the “RandomSeed Error”? The virtua box never lets me create a machine with the downloaded vmdk of mac os 10.14, ive tried downloading all the different types of files. D you have any screenshot? Is there a possible way to use FaceTime on this? First of all: very good tutorial! There was a time where the random seed error was because of the MacOS 10.14 Mojave but now I don’t know how to fix. by the way please tell how much you waited that the random seed window should go away. If you have not waited, it will take some time. I tried to start Virtualbox again and now it gives this error: “It didn’t work to make the Virtualboxclient COM object. The program is being closed now. Het is niet gelukt het VirtualBoxClient COM-object aan te maken. Het programma wordt nu afgesloten. I didn’t change anything but putting the PC off and back on. PS I didn’t get an e-mail notification that you answered although I clicked the option to do so. The problem above is resolved if I run Virtualbox as administrator. I left the random seed window open for about 20 minutes, nothing changed…. Now I tried both ways using the ISO file. I used a tutorial in Dutch and got the following error. I could send you the logfile but that’s very long..
A log file is available in “C:\Users\wimva\Documents\Virtual Machines\macOS 10.14 Mojave\vmware.log”. Looks like something is wrong with the monitor, no? I also post this in the comments of the VMware tutorial because it’s about the 2 methods. Another thing: I still don’t get any mail notifications when you reply. Any news for support to AMD procesors? No, there is no news. Whenever I try to add existing hard drive in virtual box, the file isn’t there. I think I am not unzipping the file from zipbox. How do you do that? Try to unzip the file with 7zip or WinRAR and retry it. Great tutorial! Everything worked except for 2 things: One, I cannot access any audio because in system preferences the computer speaker does not show up, and two: whenever I try to input my Apple ID, it does not work. Solutions? i just want to know before doing this, does imessage, internet and sound work? Yes, it works the same as an original operating system. i cant get any sound devices showing up in OSX after installing Mojave as a guest system. Try these solutions, it will solve the sound issue on your Mac. 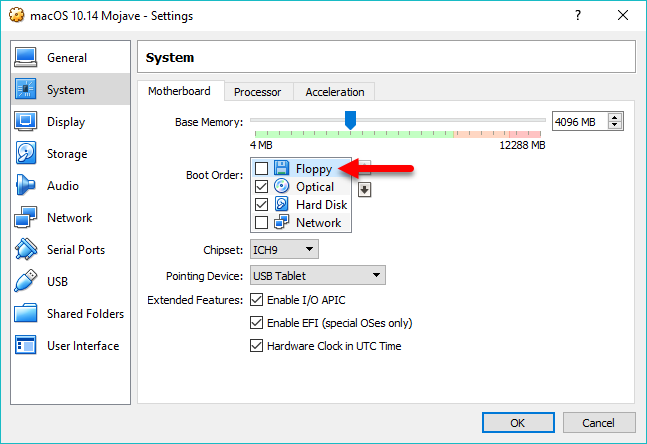 If the system runs slow, please check CPU, Memory and disk usage in the Task Manager which programs consume more disk and memory, in case if you don’t need them, you can stop them from there. Also the startup programs sometimes slow down the system. do you have knowlage of systems with new nvidia cards that macos run smoothly on them? I have the “Mac” running..but I wanted to install the Guest Additions, have somebody tried? I am able to get it to run, only problem I’m having is not being able to log into my apple id. It says this mac can no longer create an ID, when trying to log into my existing one. So I thought maybe I will just try logging into it when I open the message app, but it just acts like its loading then stops. Not sure what that may be from? Concerning AMD processors, I have a AMD Ryzen 5 1600 Wraith Spire Edition (3.2 GHz) processor. Following this tutorial I was getting blocked with a black screen mentioning at the end ‘End RandomSeed’. This allows me to go further and start the installation of Mojave. I thought it was solved, but it fails nearly at the end of the install without any message, the VM suddenly restart. I precise that I’m using an iso image created from my macbook. Thanks for all the good advices. I’m using AMD Ryzen 5 1600 Wraith Spire Edition (3.2 GHz) and following this tutorial I was getting stucked with a frozen console displaying ‘End RandomSeed’ at the end of the display. And I can get further and launching the setup of Mojave. I was very excited. Unfortunately the install stops nearly at the end without message and the VM restart. Hi. The link to the iso file does not contain any file. Its just a zipped text file. Do you have any iso somewhere else? I have checked the links, they contain the files. Please recheck it. no man. Just a txt file showing when we open the link. The link is updated, now it contains the files. You can check it now. Yes, just a txt file nothing else. Hi, I have the same issue as Muscled Beard, only a blank .txt file is in the folder. Thanks. The link is updated, it must be working correctly now. Please check it now. Monitor Resolution and multi-monitor support: I installed Oracle VirtualBox 6.0. I then installed the VirtualBox Extension Pack 6.0.0r127566. Using that configuration, I’ve installed Mac OS X 10.14 Mojave. I’ve been able to get the monitor to work at the resolutions listed below. I have not been able to get a second monitor to work. The VM doesn’t seem to know that a second monitor is available. Nowhere does it show any information about a second monitor. I’d appreciate any help with that issue. I think I’ve followed the instructions correctly, but the VM doesn’t recognize any input whatsoever. No keyboard, no mouse. This happens in virtual box 6. Great guide, very detailed. It worked straight with a small error that got fixed with the extension pack. Do you think I can export the VM and run it to ESXi? You may try it once, it might work perfectly. Please can you tell me what is the problem! Installation successful, but no mouse recognized. When I log in and type my password, the System accepted my password and a few seconds later tell me, my keyboard must be initialized. And after that no keyboard and no mouse response. I installed extension pack before building MAC virtual machine. Hi, I’m wondering will running this on my PC enable me to download and run programmes that are only meant for Mac OS? such as Logic Pro and Pro tools? When I try to download the image from GoogleDrive it says that the download limit for this file has been reached. Can you fix that so we can download it? The links are working properly now. Please check it now and download. Hi, it is not working again. could you please fix that? Hi, It’s fixed now, you may check it now. your tutorial is well explained. I have followed every step but somehow it doesn’t work. When I start the VM it is stuck at that code screen saying shell> and nothing happens. Do you know what the problem may be? I am using an AMD Ryzen 1600 and an AMD RX 480. Here you can see a screenshot of that screen, where it stopped loading. Hi, thanks for the tutorial, after much reading and trying I cannot get the VMDK hard disk to boot. I get the UEFI shell. I have virtualization enabled in my BIOS, I have executed the code properly because I’ve checked the .vbox file and I still don’t know what’s wrong. I have an CORE i5-6500 16gb RAM and an NVIDIA video card. can you help me please with Step 7? The OS is not booting and I stuck on the UEFI Shell screen. Do you have any solution? How do you get audio working in Mojave guest using virtual box 6? Is there a kext we can use and if so how to install it? Hello. Your tutorial is remarkable and simple. Thank you so much !! I will follow your tutorial, then I will try an installation on my XIAOMI MI AIR 2018 8250U which seems well adapted to welcome Macos. Continue, your work is of great help to many people. Sincerely from France, Jean Louis. Thank You, Jean Louis, for your Appreciations. I’m Glad it helped you sir. Excellent article but I’ve encountered one problem. When using the Finder Bar > Go menu – nothing works when I select anything from there such as ‘Recents, Documents Applications’ etc. I’m using Win 10 16GB RAM, i7 8th Gen and allocated 4 Cores with 8GB Ram. Reinstall The macOS 10.14 Mojave on VM. Thanks for your time and effort for making this great tutorial! I’m at a grey screen. MacOS loads normally and seems to boot, but after getting the Apple icon, I simply get a grey screen that never disappears. My touchpad also doesn’t get detected. Most of the times this error occurs because of not enabling the Cache, so close Power Off the VM and go to settings> Storage and check the box of Use Host I/O cache. If it didn’t work, I have no more idea. Cache is already enabled… then I have to wait for a bug fix I guess. Thanks for your reply. Which are the codes for Virtual Box 6? Hey, Here are the codes. Hello i have some error code, how to resolve? First: Thank you for the tutorial. Sadly, I have a problem with using the codes. I followed your Tutorial Step by Step and installed Virtual Box on the C Drive and unpacked the .vmdk File on my Desktop. Amazing! Thank you! Great Guide! Solved: End Randomseed alternative solution. On my AMD Ryzen 2500u (Asus Nitro5) I got totally stuck with the “End Random Seed” issue. I found the crux (after trying also through VMware) was the Device/Credential guard was getting in the way. I found following this tutorial resolved it https://www.youtube.com/watch?v=CGpv2Dvzyeg . I would guess this may only apply to Win10 Pro and not win 10 home? Hope this helps someone as much as all these guides help me. Restart the installed MacOS Mojave and try again. Had to do a few things to get past the End Randomseed error. I believe it’s because I’m on AMD. It then took a while to boot, some non-fatal errors, and currently waiting for the setup, but that’s some progress. Here’s what I’ve done. I tried it with both codes (v.5 and v.4) and tried it multiple times at different disk locations. If you are running VirtualBox 6x. the code is updated. You can take it from the article above. What of error ““applekeystore operation failed virtualbox”? Great efforts !! Thanks for sharing !! Please redownload the Winrar or 7Zip and try again. 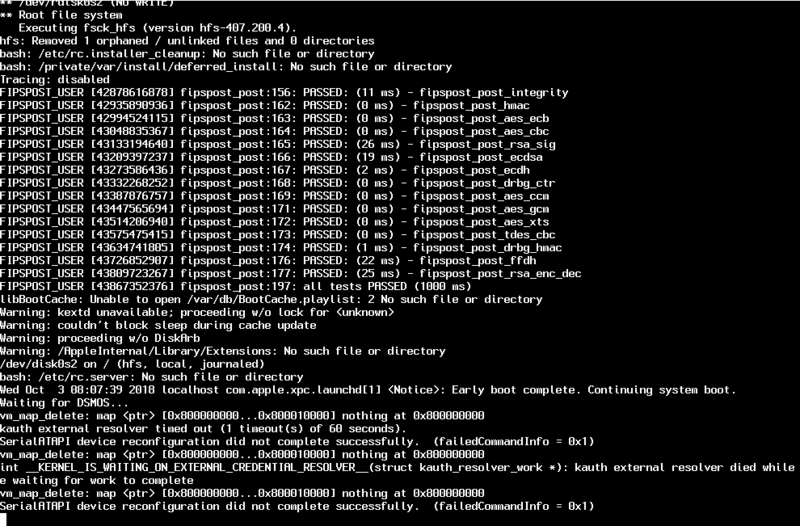 Great work but when booting up at step 7 I’m stuck at the UEFI interactive shell page, what can I do to resolve this? Boot From APFS EFI Boot Image. What would be the code at the end for Virtual Box 6.x?